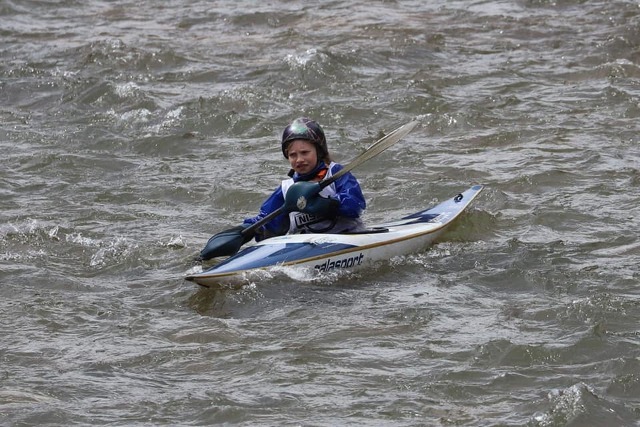 Eleven-year-old Ava Harachak of Julian won the youth solo class in the Red Moshannon Downriver Race. MOSHANNON — The 216 racers in 174 boats that raced the 7.1-mile Red Moshannon Down River Race on March 30 got a beautiful day with near perfect conditions during the 52nd running of the annual race. Racers hit the water near the little town of Grassflat and paddled down the river to the Route 53 bridge near Moshannon. The Red Mo is one of the longest running down river races in the country. The water flows pretty fast throughout the course and racers encounter some Class II white water, said race director Aaron Roos. Roos said they had racers come from all around the northeast and participants from as far away as Florida. The fastest overall paddler this year was Garet Strouse, of Philadelphia, in a composite Wild-Water race kayak. Eleven-year-old Ava Harachak, of Julian, won the youth solo class with a time of 1:07:33. “Ava is a youth slalom racer and has a bright future,” said Roos. The race had a Sasquatch theme this year, and one of the many safety volunteers, Chad Maurer of Steele Hollow, dressed up as Bigfoot, keeping everyone safe and smiling out on the water. Other top finishers included: Jacob Matchock (1:15:18) SUP unlimited men; Tina Fischer (1:11:45) SUP unlimited women; Ken Damellio (1:06:19) K1 men rec short; Dale Glove (1:02:26) men rec medium; John Dunkleberger (1:01:02) K1 men rec long; and Adrienne Fye (1:07:29) K1 women rec short. Also, Jennifer Rivera-Rockwell (1:05:35) K1 women rec med; Linda Daugherty (1:08:38) K1 women rec long; Brian Wicks (1:07:50) K2 unlimited; Christopher Malec (1:02:45) K1 men whitewater; Rebecca Renner (1:03:16) K1 women whitewater; Mark Linn (1:03:15) K1 master; and Kyle Simpson (1:14:27) OC1 men short. Also, Melissa Shafer (1:11:51) OC1 women long; Scott Shaffer and Grant Coats (1:02:12) OC2 short; Paul Gruber and Fran Kopta (1:00:28) OC2 long; Teresa Stout and Steve Martin (1:01:14) OC2 mixed; Scott Lee and Dana Lee (1:02:11) OC2 century; and Ruth Krieger and Grace Jones (1:16:57) OC2 women. Also, Mitch Evans and David Evans (1:04:17) OC2 composite rec; Daniel Jones and Evan Jones (0:58:45) OC2 unlimited; Ed Sharp (1:02:47) OC1 master; Brian Palmer (1:00:49) OC1 unlimited; Ethan Van Horn (1:05:15) K1 whitewater composite men; Natilie Thomas (1:06:41) whitewater composite women; and Graeme Biggin (1:01)02) K1 unlimited.